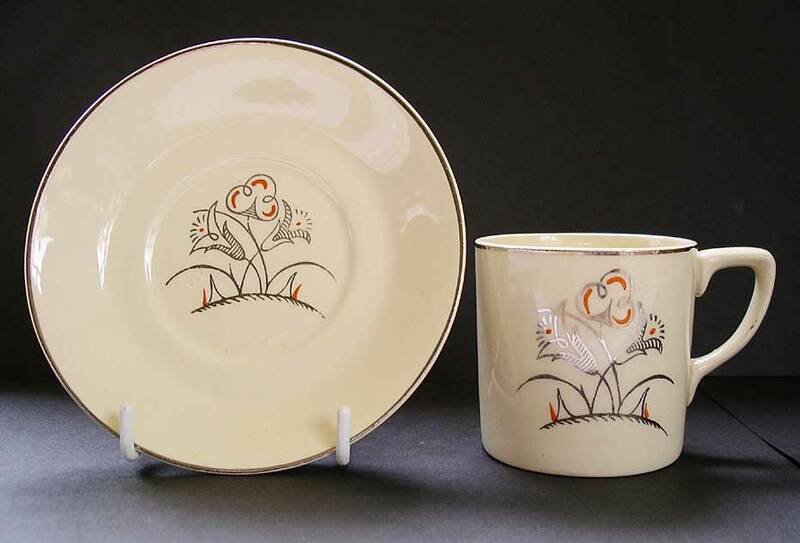 "This super cool Johnson Brothers art deco coffee cup and saucer set is classic art deco style. Great shape and potting with subtle, restrained, modernist stylized floral decoration. Like the best of the Art Deco period output from the Brothers Johnson - great style, minimalist, contemporary and very modern. There are four coffee cans and five matching saucers." Antiques Expert Hamilton Bear. 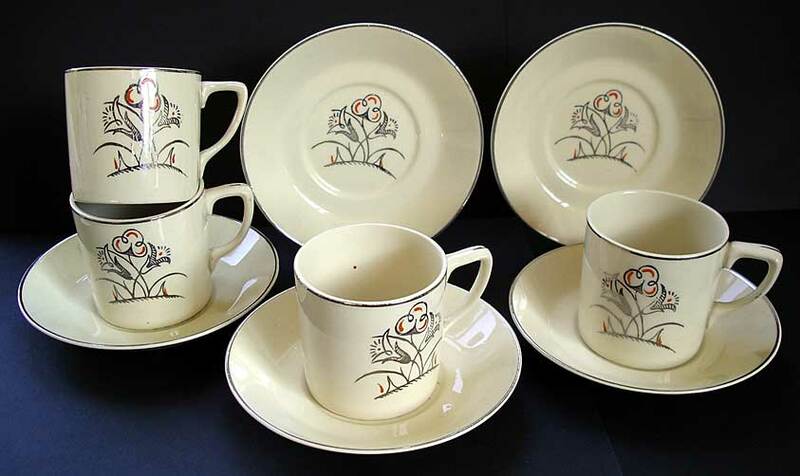 References: The potting quality of Johnson Brothers art deco period production ranks among the very best. The clear cut lines and complimentary restrained decoration were highly thought of in design circles during the 1920s and 1930s. With Johnson Brothers art deco less is definitely more. The Studio (1936) critical review of ceramics production recognised the modernist designs of Johnson Brothers for high artistic values and principles in the machine-age: "their aim is to produce earthenware bodies of fine texture and colour... to encourage decoration in printing, lithography and stamping which will show a real appreciation of these more mechanised techniques and enable the artist to produce honest work... not the 'mass production' travesties of hand-painting to which one is accustomed." 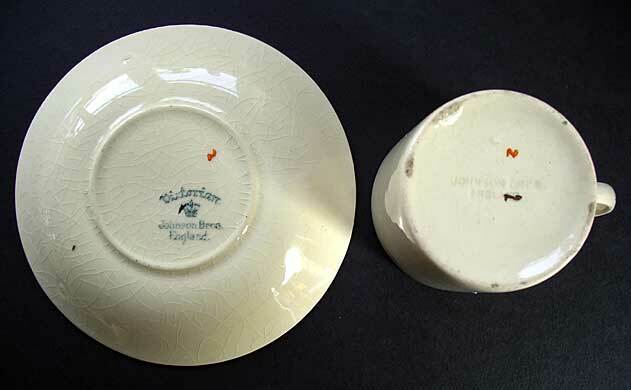 The renown ceramic artist designer Gordon Forsyth was also a great fan, praising Johnson Brothers as an "outstanding example of excellent cheap production." Dimensions: width saucer 115 mm max. height cup 55 mm max. Marks: as illustrated below. 'Johnson Bros" impressed to can. "Victorian" may be the shape range. Difficult to imagine a more inappropriate title for a set like this. Condition: Excellent condition for display with good fresh looking decoration. There are no chips, cracks, hairlines, staining or restoration. Minute specs of wear to outline of decoration. Reflections on coffee can, main image above, are not wear.